On October 12, 1909, Eulalia Garcia Maturey crossed the border into the United States from the city where she was born, Matamoros, Mexico. She and her mother settled in Brownsville, Texas. In those days, anyone could cross the border with no papers, no permission slips, and no trouble because nobody was actually trying to stop immigrants from Mexico. Now, after 101 years of living legally in the United States, Ms. Maturey is becoming an American citizen, officially, with the help of a 69-year-old document. “I want to spend the rest of my days in this life living legally in the United States,” Maturey told CNN this week. “I was raised here, and I want to die here.” Maturey got a little help from a 69-year-old document she got as a result of the World War II Alien Registration Act. 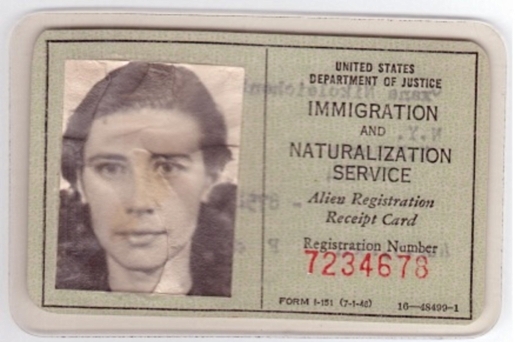 The Certificate of Lawful Entry, which she kept in immaculate condition since she first got it in 1941, is what helped INS officials verify Ms. Maturey’s status as a legal immigrant into the United States, even though it predates the computer age by about 55 years.